in cooperation with Federal and State extension workers. than last year and later than usual. a II-rgc movement of grass-fat :,.--:rlinis from Texas in April, May, and June. ewes during the sane period was the highest for any month in several years. :;-c.:.b.r and $9.94 a year earlier. January, about the same as in February 1936 and above average for the month. in the corresponding period of 1935-36.
increase in this area was more than offset by reduction in the Corn B It. March and April will be somewhat smaller than in those months in 1936.
estimated to be at least 10 percent smaller than the early lamb crop of 1936.
largo part of the Aeerease from last year has been in California. the end of May will be relatively small. have developed slo-.-ly and marke+ir. will be later than last year. per 1,; ewes lambing was much larger than last year and was above avera-e.
as in 1936, the number marketed before July 1 may be smaller. of ewes _r:-.inl before !arch 1 was reported to be much below average. able for good pasture and r2r,-e feed with the coming of warm weather. extent by the relatively lar-e movement of ;rass-fat yearlings from Texas. inasmuch as supplies of these probably will be less than a year earlier. affect prices of new cron s-rin- lambs to some extent. fairly well maintained near present levels during the sprint and early su- mer. ly small and demand conditions continue favorable. -rjiuction of pulled wool in I'1J:- w-s estimated at 65,2 ^',"' 3 pounds. not be as 1-r,- e as in 13.lJ. re.oilar nonthly report of the larea. of Agricultural Econor.ics. 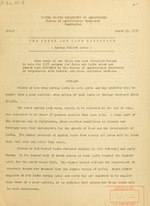 Supplies of sheep and lambs, 1936 with comparisons, and February 193? Item : Unit : 1924- : 1935 : 1936 : 1924- : Feb.: Jan.: Feb.
Receipts at 7 markets . : "
:1924- : 1935 : 1936 : 1924- : Jan.: Dec.: Jan.
Chicago, Kansas City, Omaha, Denver, St. Joseph, Sioux City, anmi St. Paul. Classification Dec. Jan. Feb. Dec. Jan. Feb.: Dec. Jan. Feb.
: Dols. D:ol Dols. Dols. Dols. Dolz. Dols. Dols. Dols. 2/ Cents per rpr..n, scoured basis. 3/ Bureau of Labor Statistics.